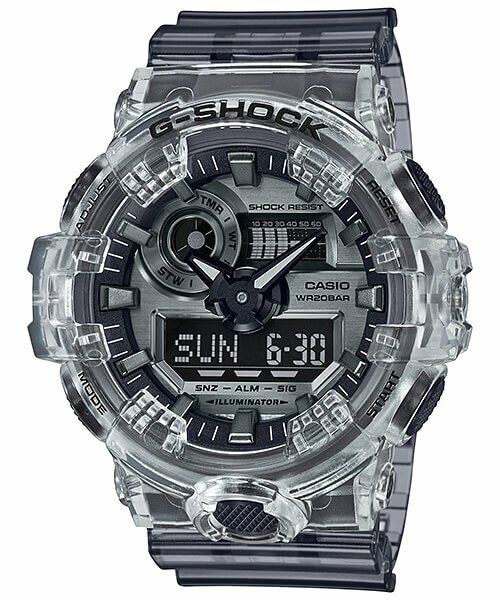 The G-Shock Clear Skeleton Series includes five watches with two classic digital and three large analog-digital models with the common theme of translucent bezels and bands. 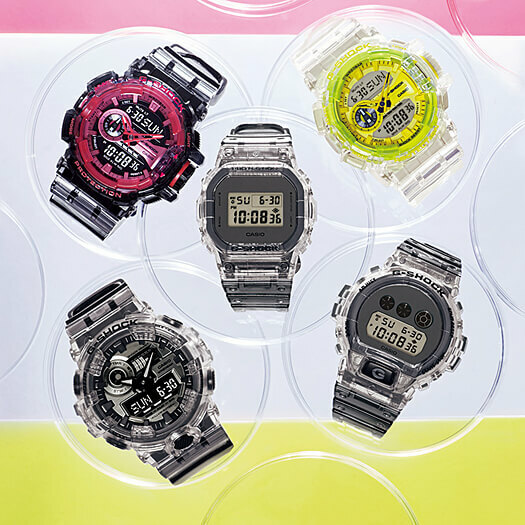 The DW-5600SK-1, DW-6900SK-1, and GA-700SK-1A have clear bezels and smoky gray semi-transparent bands and keepers. 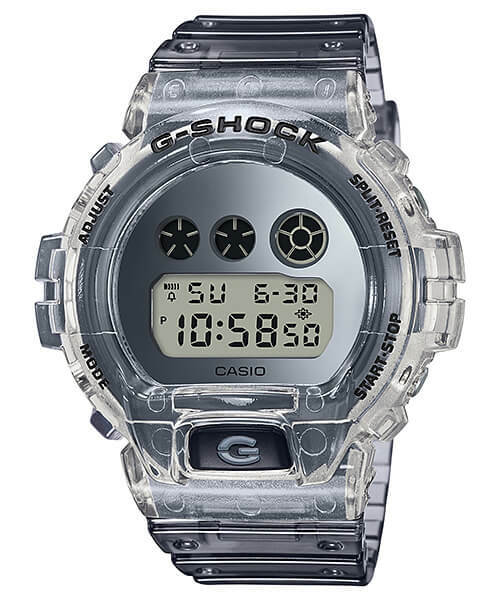 The digital DW-5600SK-1 and DW-6900SK-1 have a gray “metallic mirror” face and the analog-digital GA-700SK-1A has a gray metallic display. 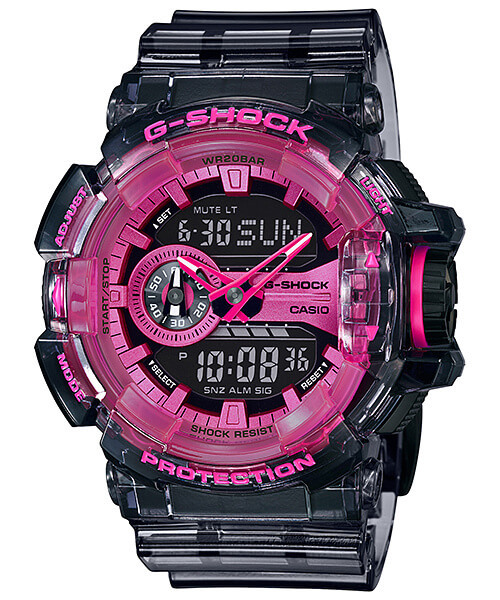 The GA-400SK-1A has also has smoky bands and a dark gray and neon pink translucent bezel. 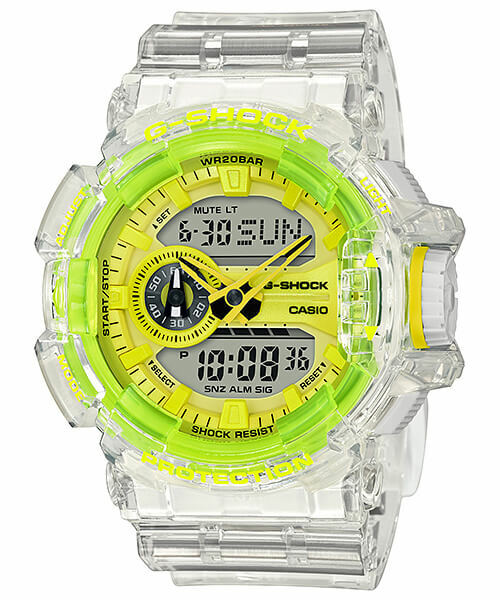 The GA-400SK-1A9 stands out from the rest of the series with its clear bands along with a clear and lime green bezel. The DW-5600SK-1JF (list price ¥12,500 JPY), DW-6900SK-1JF (¥12,500), GA-400SK-1A4JF (¥17,000), GA-400SK-1A9JF (¥17,000), and GA-400SK-1A9JF (¥15,500) will be released in April 2019 in Japan. The DW-5600SK-1, DW-6900SK-1, GA-400SK-1A4, GA-400SK-1A9, and GA-400SK-1A9 will also get a wider release in Asia. 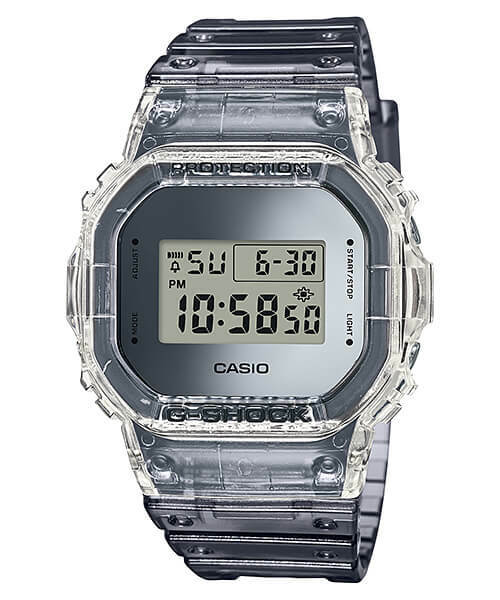 Update: Casio America announced the DW5600SK-1 (list price $110 USD) and the GA700SK-1A (list price $120 USD) for a May 2019 release. With clear bezel, smoky gray translucent bands, and gray metallic mirror face. Mid-size digital model featuring the EL backlight. With gray and neon pink translucent bezel and smoky gray translucent bands. Extra-large analog digital model featuring the electronic rotary switch crown. With clear and lime green translucent bezel and smoky gray translucent band. Extra-large analog digital model featuring the electronic rotary switch crown. With clear bezel, smoky gray translucent bands, and gray metallic face. Extra-large analog digital model featuring front LED light button and 5-year battery.